RPI is constantly looking to reduce the stress on the firefighter while improving the overall safety of the firefighter. If we can reduce ounces, that eventually leads to pounds, which leads to more effective firefighters on the fire ground. So, in 2016, RPI released the RPI 1/23 Hook, our next generation hook following the original RPI Hook. The RPI 1/23 Hook’s design is similar to the original RPI Hook, but is about four ounces lighter than the original RPI Hook, and includes a wire gated hook tip to allow for easier tying off of the hook to a remote object. 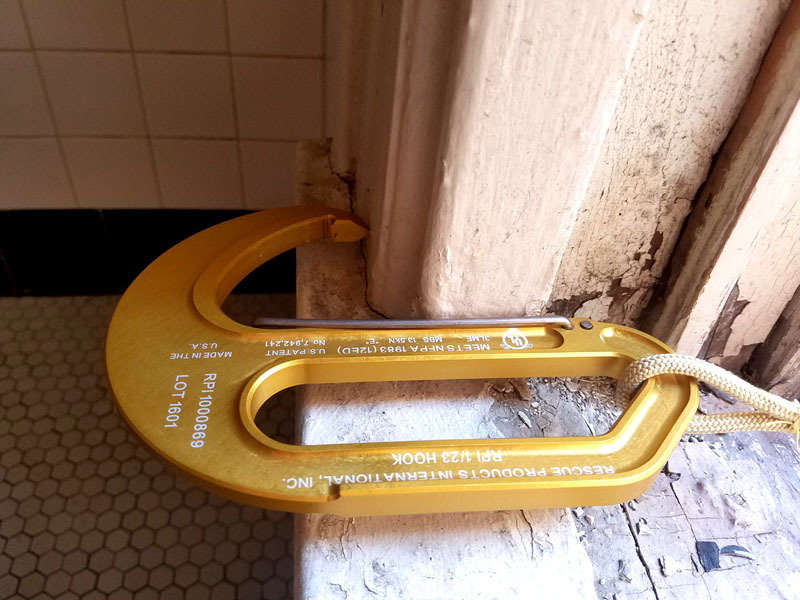 The RPI 1/23 Hook can still easily be anchored directly at the window sill, can still be used with both a halligan tool and a 6’ NY Hook, but now allows for easier tie-off when used in anchoring around an object by simply wrapping the tip of the hook and allowing the wire gate to close, preventing the rope or webbing from possibly sliding off of the tip of the hook. At 8 ounces, the RPI 1/23 Hook exceeds the minimum breaking strength MBS of 13.5 kN (3034 lbf.) required by NFPA 1983. 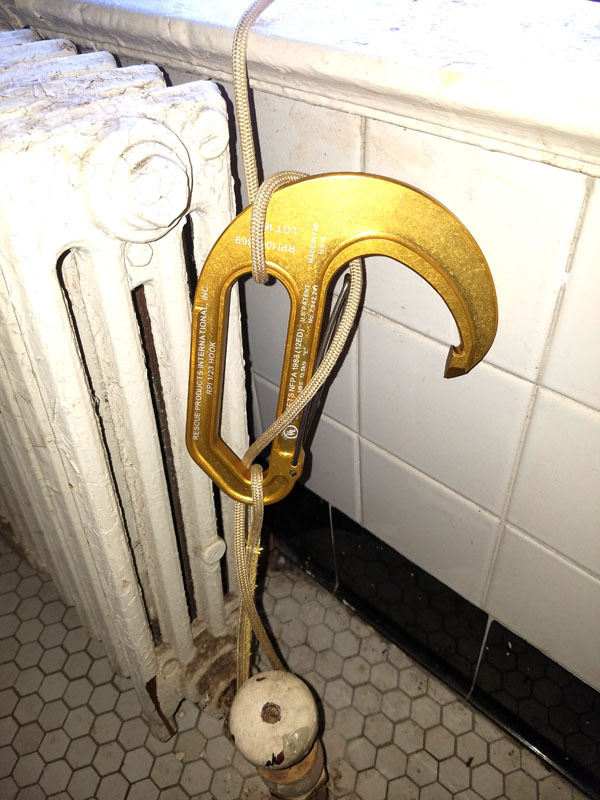 The RPI 1/23 Hook is classified by Underwriters Laboratories. A portion of the proceeds from the sale of the RPI 1/23 Hook will be donated to the Lt. Joseph DiBernardo Foundation. Handle opening able to accommodate a halligan, 6’ NY Hook, and other normal hand tools. Handle opening designed to accept a bight of rope to pass through and over the tip of the hook for rapid tie-off. The rope can be wrapped around the tip of the hook and is held in place by the carabiner style wire gated closure. 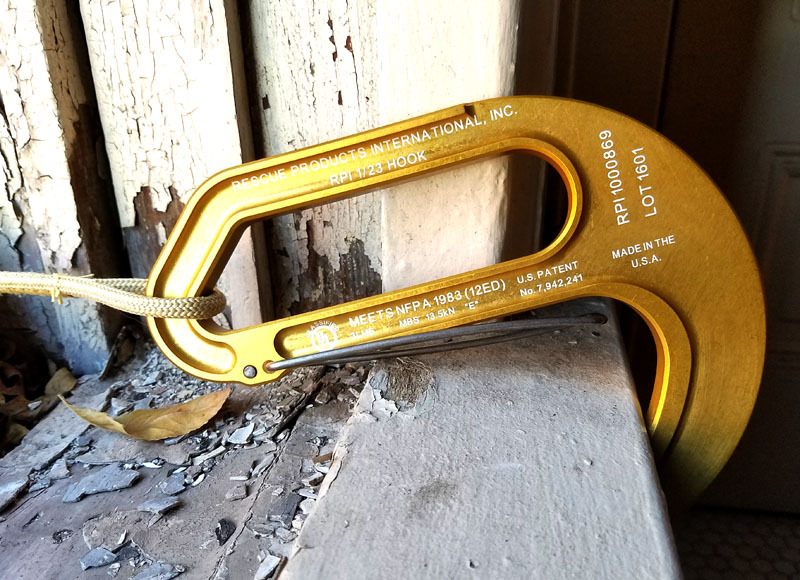 The RPI Hook was the first escape anchor hook on the market to include a “hitching slot” or handle opening and the second on the market behind the Crosby Hook in 2006. Since the development of the RPI Hook, almost every other escape system manufacture has developed a similar hook with the handle opening yet none of the other hooks are as versatile as the RPI Hook, nor can accommodate our common fire service hand tools like the RPI Hook. 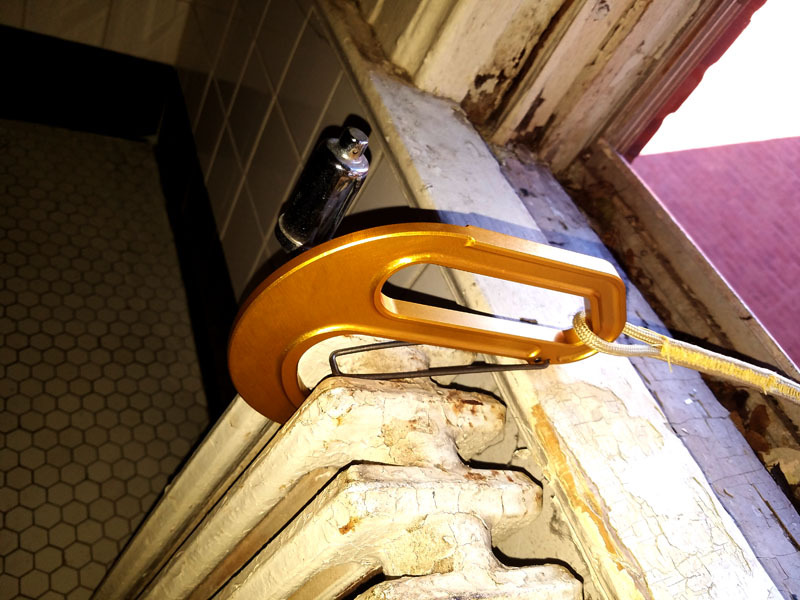 The RPI Hook was originally designed to function like a carabiner on the end of a rope plus a hook than can anchor directly at the window sill through a hook configuration. The handle of the RPI Hook is designed to accommodate our common truck tools such as a halligan or 6’ hook. 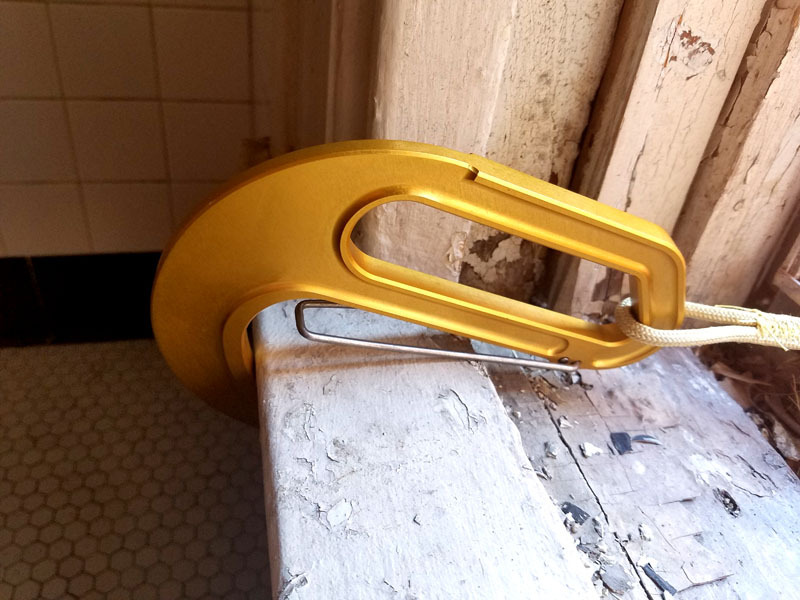 The tool can be slipped through the handle opening and the tool can span the corner of the window to create a substantial tie-off point for the hook. 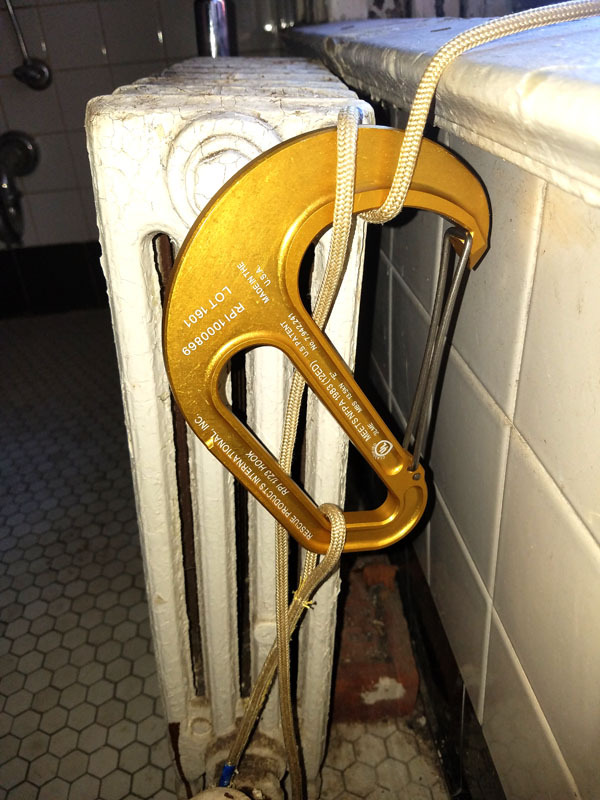 Additionally, the firefighter has the ability to anchor directly at the window using the tip of the hook or by wrapping the attached rope around a substantial object, taking a bight of rope up through the handle of the hook, and by placing the rope over the tip of the hook creating a positive tie off of the hook and rope. 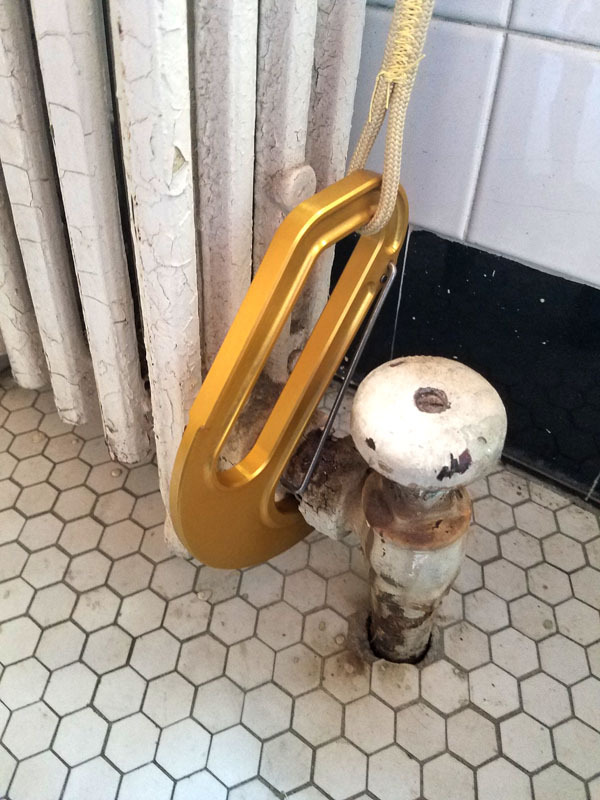 The RPI Hook was so ahead of it’s time that when it was designed, there was no Escape Anchor Classification in the NFPA 1983 document for it to meet for performance requirements. So, the RPI Hook had to be Classified to the “Light-Use Auxiliary Equipment Standard, requiring the minimum breaking strength (MBS) at the weakest configuration, the point, had to handle 22 kN. or 4946 lbf. 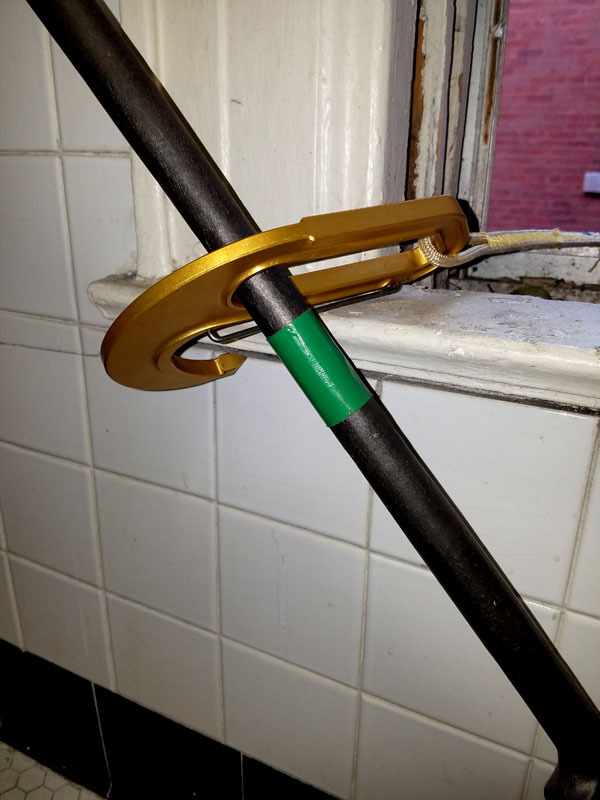 Today the RPI Hook still meets this strength requirement and is classified by UL as both “T” and “E”. Rescue Products International. All rights reserved.